The swivel hitch gives the 946 and 956 Mower-Conditioners excellent maneuverability. NOTE: Requires a 1000-rpm PTO (1-3/8-in.) and a 2250-psi hydraulic system with dual selective control valve (SCV). NOTE: The PTO can be converted to a 1-3/4-in. driveline by installing yoke (AE56235) and cross bearing assembly (AC15878). Order through Parts. The rockshaft swivel hitch attaches to the lower arms of a Category 2 or 3N 3-point hitch and can be used with or without a Quik-Coupler. This hitch enables cutting square corners without the need to reposition the platform using tractor hydraulics, making it easier to cut around field obstacles. The U-joint angles of the tractor hookup remain constant for reduced driveline noise and vibration. The rockshaft swivel hitch is easy to hook up. The spring-loaded attaching arms are tilted upward when the hitch is set on the built-in parking pad. The arms can be positioned to permit easier alignment with the 3-point hitch arms. NOTE: The rockshaft swivel cannot be converted to the drawbar swivel hitch configuration. The drawbar swivel hitch attaches to the tractor drawbar with a drawbar extension. This enables the mower-conditioner to be used with tractors without a rockshaft. The drawbar swivel hitch is designed to be towed by a tractor only (the static load on the drawbar is approximately 1700 lb) and includes a screw-type jack and safety chain. NOTE: The drawbar swivel cannot be converted to the rockshaft swivel hitch configuration. An easy-to-adjust lever (arrow) is used to position the swathboard. 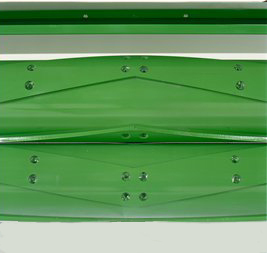 Swathboard controls the crop flow into the windrow-forming shields. The windrow width is adjustable from 40 in. to 100 in., depending on crop conditions, when equipped with a roll conditioner or an impeller conditioner. The V-10 steel conditioner rolls feature 10 angled flutes arranged in a chevron, or V-pattern along the length of the steel core. Steel rolls offer improved wear life over urethane rolls, particularly in adverse crop conditions. Tri-Lobe steel conditioning rolls have three intermeshing chevron lobes to crush the length of the stem for improved conditioning and faster drydown. The rolls are manufactured using a patented process. The steel material increases wear life, especially in abrasive crops or soil conditions. Durability is a distinct advantage compared to other crusher-style rolls made of rubber or urethane. The chevron design of the rolls gives positive feeding and improved crop flow. These rolls are well suited for use in alfalfa, where reduced curing time results in less bleaching of the crop. 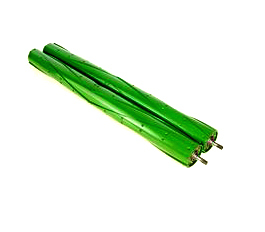 In heavy, thick-stemmed crops, such as sudan or sudex, the steel construction of the rolls does a very good job of breaking up the nodes on the stems to improve drydown. The shafts on the Tri-Lobe rolls are steel forgings that are then machined. These precision parts have minimal run-out, which means the rolls themselves rotate precisely around their axis. This precision enables the rolls to be adjusted to a minimum clearance for consistent conditioning along the length of the rolls. The machined, forged roll ends are bolted into the core of the Tri-Lobe steel roll. In the event a roll end is damaged, the entire roll does not need to be replaced. 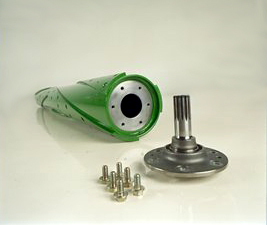 Each shaft can be replaced individually, resulting in lower repair costs. For serviceability, each roll end has two threaded holes, so that bolts can be used to pull the shafts from the steel core of the roll. The 946 and 956 Mower-Conditioners are also available with large, 10-in. diameter, 106-in. long molded urethane conditioner rolls. The urethane roll conditioner works well in legumes, especially alfalfa, and most all-grass crops. In general, roll conditioners are better suited for thick-stemmed, cane-type crops, and taller grasses over 5-ft tall. Molded urethane rolls are formed by ''cool'' molding process that does not distort or warp the steel core of the roll. The intermittent recessed cleat design gives more crimping edges for greater pressure per square inch, which results in superior conditioning and faster crop drying. An impeller conditioner is available for the 946 and 956 Mower-Conditioners. Proper conditioning in a wide range of crops can be achieved when the conditioner is properly adjusted. The impeller conditioner works well in legumes, especially alfalfa and most all-grass crops. Impeller conditioners are not recommended for thick-stemmed or cane-type crops over 5-ft tall. 2. As plant passes through, it rubs against the conditioning hood (A) and other plants. A simple lever adjustment (arrow) controls the spacing between the tines and the conditioning hood. The closer the hood is to the tines, the more aggressive the conditioning is. Adjustment slots give an easy reference point to control the degree of conditioning. 3. The speed at which the tines rotate will also affect the degree of conditioning. Two impeller speeds can be achieved by interchanging the drive sheave (A) and the driven sheave (B).